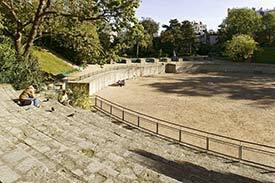 ABOVE: The lions and gladiators are gone, but much of the 15,000-person amphitheatre remains nearly 2,000 years after the Arènes de Lutèce were built. Along with the Gallo-Roman Baths at the Musée National du Moyen-Age in the Hôtel Cluny, the Arènes de Lutèce or Arenas of Lutetia are among the oldest tourist attractions in Paris. The Roman amphitheatre, which dates back to the 1st Century A.D., was once the site of Gladiator-style combat and other Roman entertainments, with seating for an estimated 10,000 to 15,000 spectators and animal cages beneath the stands. After the fall of Lutetia in 280 A.D., the amphitheatre became a ruin and eventually was filled in as medieval Paris grew. In the 1860s, the arena was discovered during excavation for the Rue Monge (now a major thoroughfare in the 5th arrondissement), and the dug-up ruins were turned into a public square in 1896. Today, the Arènes de Lutèce form the core of a public park that neighborhood residents use for boules, bouncing footballs off the apartment buildings behind the arena, and other urban recreation. The park is open daily from 8:30 a.m. until 5:00 p.m. during winter and until 9 p.m. in summer. Admission is free. Of the three entrances, the easiest one to find is at 47 rue Monge, where an arched passageway leads from the sidewalk. (See photo at bottom of page 2.) If you're coming by Métro, the nearest stops are Cardinal Lemoine (Line 10), Jussieu (Lines 7 and 10), and Place Monge (Line 7). Photo copyright © Paris Tourist Office. Photographer: Marc Bertrand.